You will see many Buddhas all over Asia but I don’t think there is any one place that has more than the 10000 Buddhas Monastery in Hong Kong. In fact, the truth is there are actually 13,000 Buddhas. That’s what makes this place different from other temples you visit throughout Asia. If you love Buddha, this is definitely the place for you. 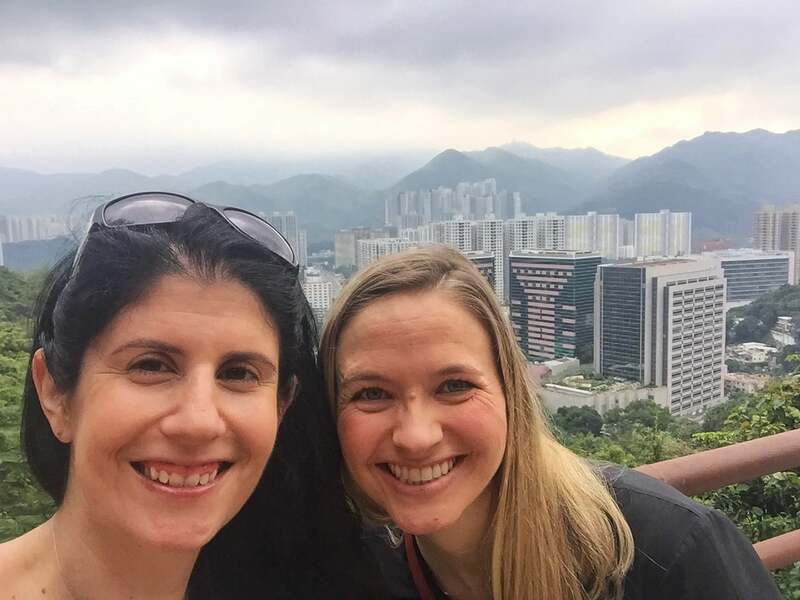 It was my friend Courtney’s first time in Hong Kong and she wanted to get some culture, so we decided to check it out. It may not be one of the top attractions in Hong Kong, but we enjoyed our visit. 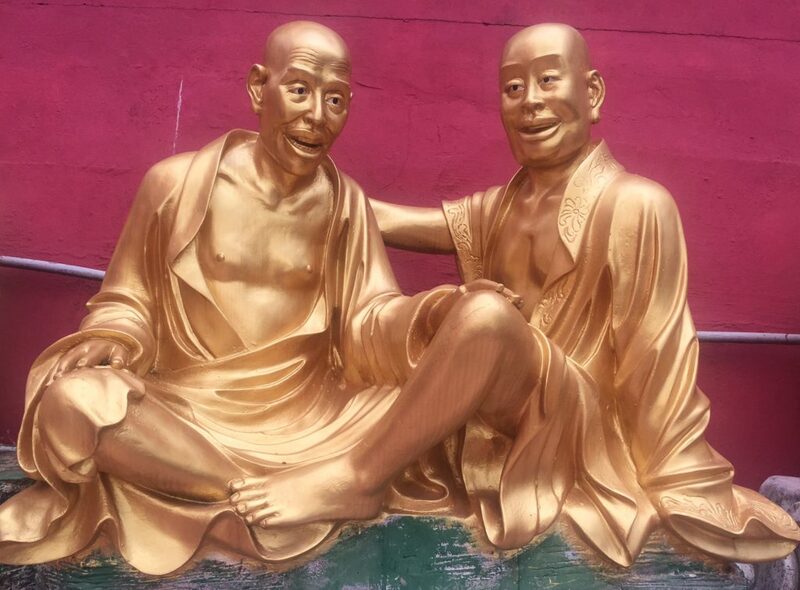 Let me tell you more about what you can expect when you go to the Ten Thousand Buddha’s Monastery and give the logistical details you need to plan your visit. 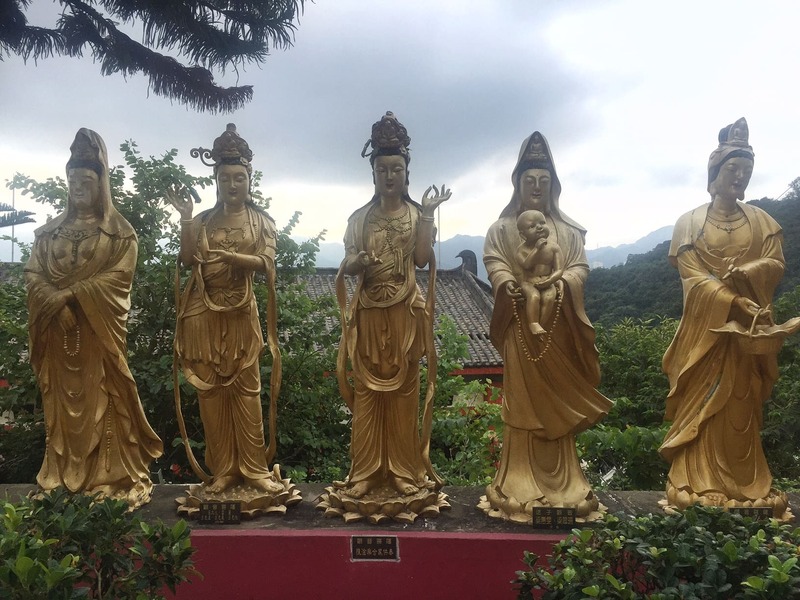 The 10000 Buddhas Monastery is located in the mountains in the New Territories of Hong Kong. Unfortunately, it is not easy to get to via public transportation, but luckily taxis in Hong Kong are cheap. We were staying at the Sheraton in Kowloon, so we grabbed a taxi from there and it only cost 110 Hong Kong Dollars (about $14 USD). Plus, we had a lot that we wanted to see that day and taking a taxi would save us precious time. We arrived at 9:00 am just when the 10000 Buddhas Monastery opened. The taxi driver dropped us off at the end of a street. Straight ahead we saw a temple, but actually, that is not the 10000 Buddhas Monastery. A local standing outside pointed us in the right direction and we saw a sign directing us to the 10000 Buddhas monastery. We needed to take a small path just to the right of the other temple. The sign pointing to the path that leads to the 10,000 Buddhas Monastery. The path seemed a little random and plain, but it wasn’t too long before we saw the sign for the 10000 Buddhas Monastery and the first of the many buddhas. Then, we began our climb up to the temples. Courtney, as we begin the climb up the Buddha lined path. The path up is nicely paved with half of it being just sloped and the other side being steps. 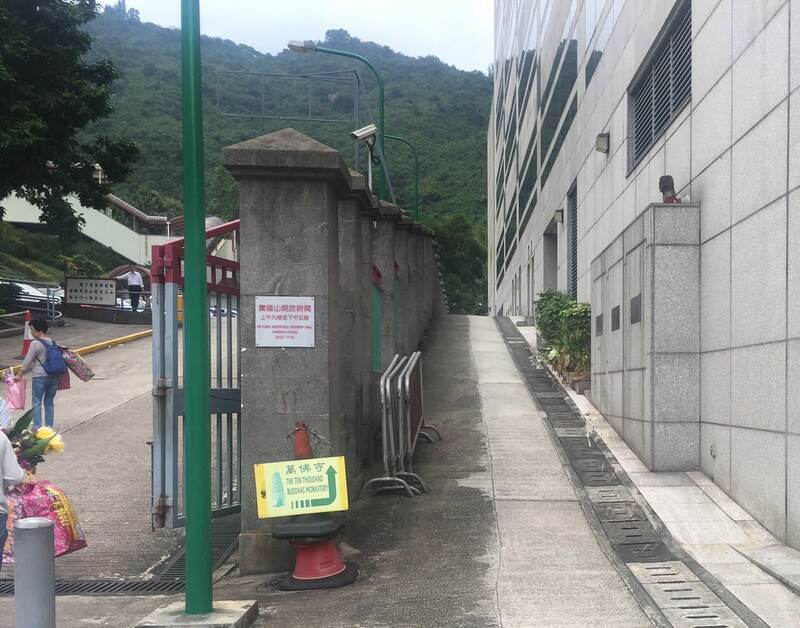 I found it much easier to walk on the stairs side but when people would come from the other direction someone has to give way and walk on the sloped side. If you have mobility issues, unfortunately, this is not the temple for you. 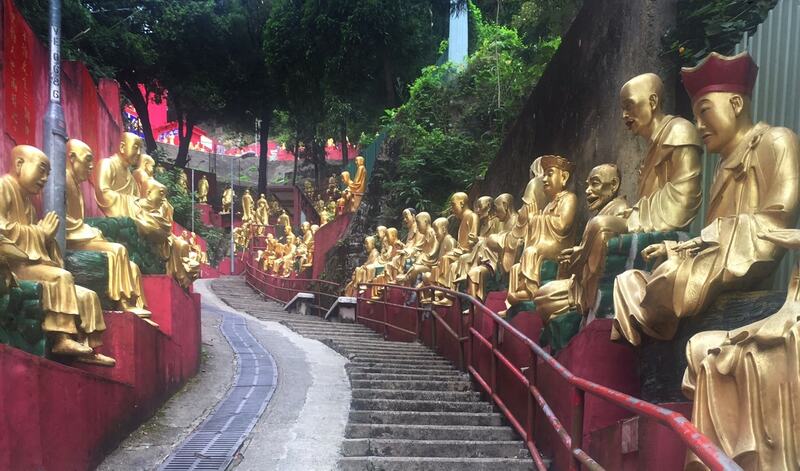 The walk up is lined by life-size gold painted Buddhas. Each one is different and seems to have its own personality. There is no barrier between the path and the buddhas but you are not allowed to touch them. Still, you should take photos with your favorites. You will also find benches periodically if you need to take a break. A good part of the way was climbing steps! After what may feel like forever, you will finally reach the temple. I definitely recommend taking a few minutes to go inside. On the columns and on the walls there are so many individual little Buddhas. From far away they look just like a random pattern, but they are definitely Buddhas. The main altar contains three large Buddha statues and the embalmed remains of the Reverend Yuet Kai, the founder of the Monastery. Unfortunately, photos are not allowed inside the temple. It is a place of worship and we did see people praying. 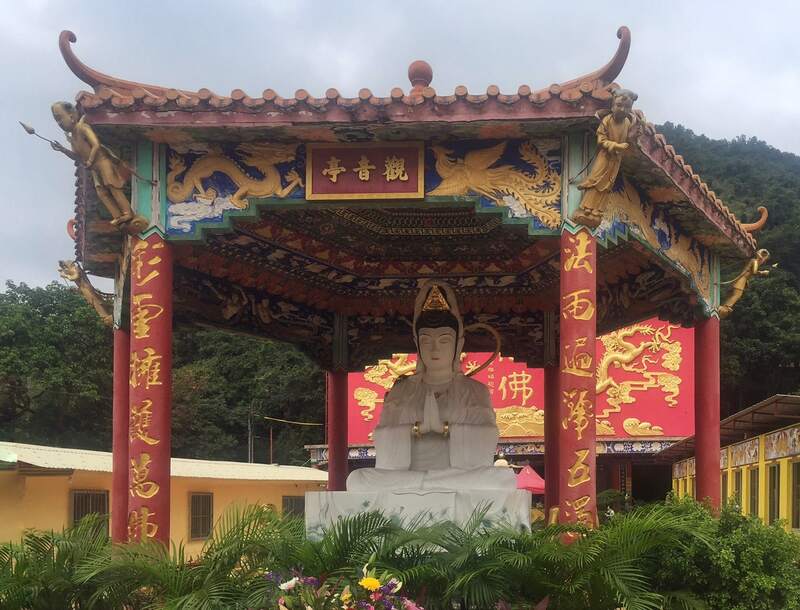 Note: If you want to see a big Buddha, be sure to also visit the Po Lin Monastery on Lantau Island. Also, be sure to take a little time to appreciate the porch area right outside the temple. There are some nice animal sculptures and the ceiling was pretty impressive. You can also find a donation box. I felt compelled to make a donation since they don’t charge admission. One of the Buddhas by the main temple. There is a lot to see on the plaza outside the temple. I loved the nine-story pagoda in the center of the plaza. It is actually the one that is pictured on the back of the 100 HKD note. I read that you can climb up for even better views, but it was closed the day we visited. There were Buddhas at each level of the pagoda and several other large Buddhas on the plaza. One on an elephant and some along the edge. Don’t forget to also admire the view from here. You can see how high you actually climbed. Selfie with a view of Hong Kong in the background. Taken at the top level of the 10000 Buddhas Monastery. There is still a little bit more of a climb to go through. It’s a short steep section to the monastery and a waterfall. You can’t go inside any of the buildings here, but you can peek inside. Some of the buildings were under construction when we visited. The waterfall was pretty impressive and taller than I would have expected. There are koi in the pond and Buddha statues all around. Then we took a little time to enjoy the view from between the Buddha statues before heading back down. The waterfall at the top of the 10000 Buddhas Monastery. Of course, the walk down is much easier than the climb up. We did see some people that were struggling. Close to the bottom, we ran into one man that was out of breath. I was wondering how he would make it all the way to the top, he still has a long way to go. Well, I turned around and he started up again. The reason he was so worn out was that he was running up the steps. We were lucky it wasn’t too hot the day we went but since it was a pretty good climb we definitely felt the humidity. If you are going later in the day or when it is warmer, I would definitely recommend bringing along some water and dressing appropriately. I also wore sandals, looking back on it, I probably should have worn sneakers. The climb was more intense than I had expected. 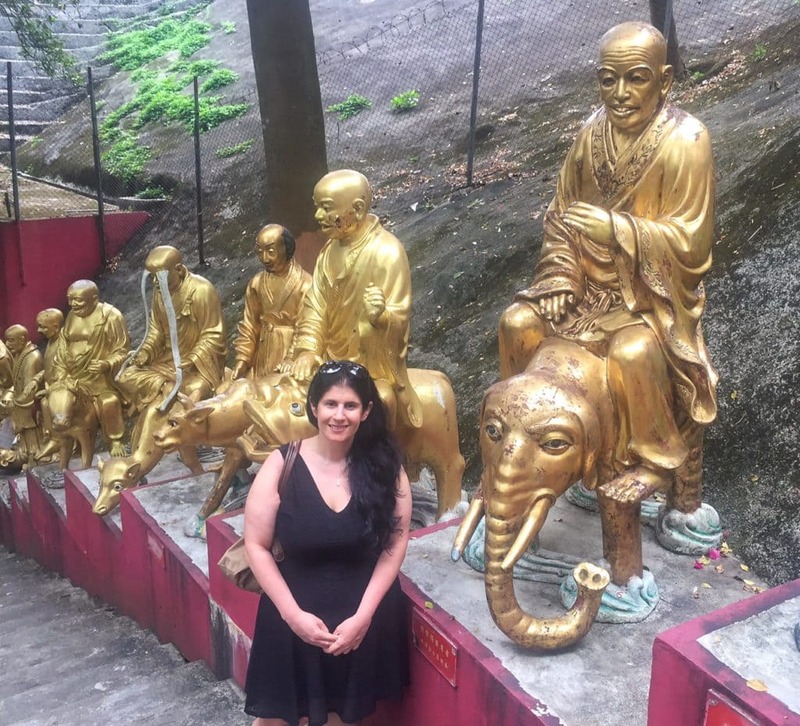 Anisa and a few Buddhas…. Also, the next time I go, I will apply some bug spray. I saw ants and felt like I got some bites, but luckily it must have been my imagination. Still, better to be safe than sorry. I also read that there were monkeys at the 10000 Buddhas Monastery, which I thought would be fun to see and photograph. Unfortunately, we did not see any while we were there. Also, this is not a working monastery. I should mention I did read about a scam where fake monks beg for money. Real monks are not allowed to beg in Hong Kong. We did not run into any during our visit, but I wanted you to be aware so you would not fall for the scam. Every Buddha had its own personality! 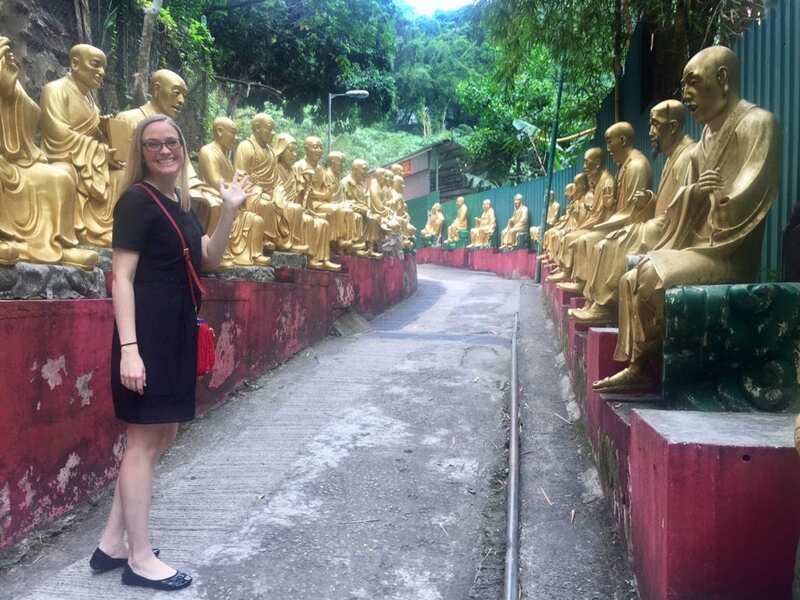 We spent about 1 1/2 hours exploring the 10000 Buddhas Monastery. I was impressed with my visit. It was just so different than any other temple I have visited. I loved that all the Buddhas were different, it made it more interesting. Plus, it is always nice when you can get a workout (over 400 steps to the top) in while you are experiencing some culture. And did I mention it’s free?! What Asian temples have you been impressed with? The 10000 Buddhas Monastery is open daily from 9-5 and admission is free. The temple and monastery are only accessible by stairs (431 of them!) or the very steep path, so I don’t recommend it for those with mobility issues. Consider the weather when planning your visit. Bring water, dress appropriately, and wear proper footwear. Watch out for fake monks and do not give them any money. If you are looking to learn more about the culture, you might enjoy these books about Hong Kong. Totally loved the post and Ur pretty faces.. keep writing and sharing.. Thanks so much! We appreciate the support. Glad to hear you enjoyed your visit too! I wish we could have seen monkeys too, but glad we lucked out with ideal weather. That’s amazing! Over 10,000 buddhas! You can tell Buddhists are very devout by their beautiful temples and monuments. It looks like a wonderful and peaceful place to explore. Thanks Stephanie. It was pretty impressive and a great place to explore! 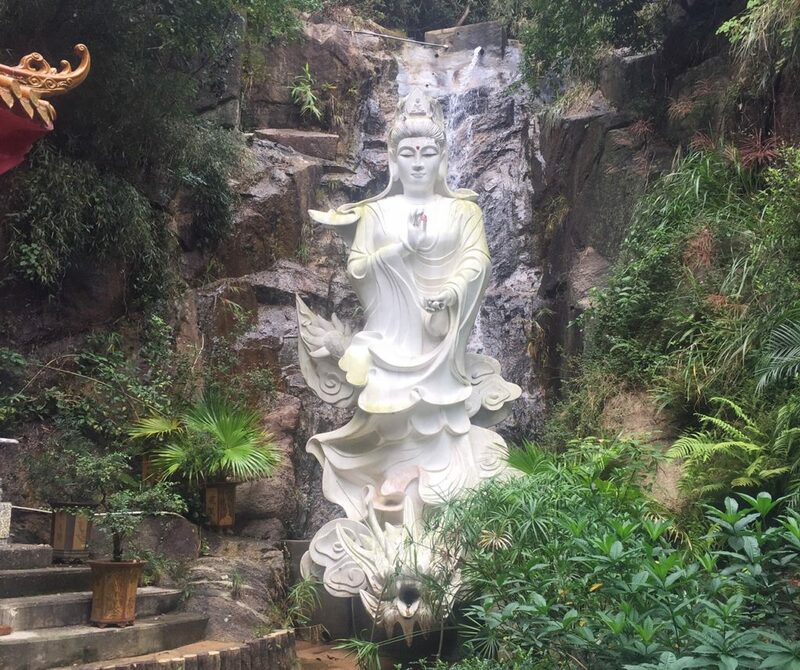 The waterfall at the top of the monastery with the white Buddha statue looks lovely. Thanks Ahila. Yes it really was. I really enjoyed my visit. That’s fascinating that the monks are all unique. I wonder if they are based on actual people. We did not have a chance to visit this place when we were in Hong Kong. I can see my teen boy running all the way up and then having to wait FOREVER for me to catch up with him. Thanks Michele. Haha yes it’s nice my friend and I add about the same energy level but I did slow her down a bit with all the pictures I took! I have been to the temple a few times and never knew there is a waterfall! Nam that’s too funny. It is a little hidden. You have to walk past some of the buildings at the top and then you will see it. Wow, great post. But I have never been come across Buddhas Monastery. Devotional and peaceful place to visit. Thanks for sharing. Thanks so glad you liked it. I hope you get to visit it one day. What a great place to visit! I love visiting Asian temples and buddhas and this sounds so neat with all those buddhas. Such a useful post and we’d definitely love to go here when we make it to HK. Mary – Thanks so much, so glad you enjoyed the post and I hope you get the chance to visit.